Excellent perspective and use of focus. Selective focusing can lead to abstraction. 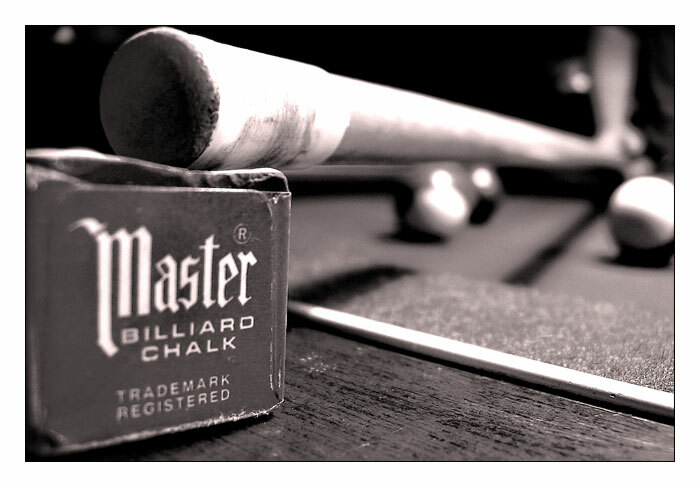 In this case, you stress the chalk by focusing on it, and allow the cue, table, billiard balls, and the arm of the player to go soft. That softness implies, rather than describes, and allows you to emphasize the incongruous scale of the tiny block of chalk made massive by your closeup vantage point. This is a great shot! As a pool player I can truly appreciate the creative thought behind this shot! Kudos! Your post captures the issue peferctly! Very good idea of article. I’m from Holland I read many publicity about it. I think idea of article is quite good and impresive to think about this world and future. Kind regards from Great Britain. David,Excellent comment…I, too, want to move to the country, and I can do it (no major issues preventing me from doing it), but the learning curve would be extremely painful and daunting. What I know is technology.What we need is some kind of training institute(s) and diocesan support. I know Kevin Ford wants to train people, but doesn’t have the wherewithal to do this on a large scale any time soon. Maybe Devin could do a post about this. That’s…pretty amazing, all nausea aside. Hard to grasp just how badly they got creamed until you see it like this.On a lighter note, I agree about the Abe Lincoln Vampire slayer thing…I saw the poster in the movie theatre and spazzed out so much, I think I embarressed my brothers.